An unread copy of Mark Kurlansky's The Big Oyster: History on the Half Shell, sits patiently on my bookcase waiting to be cracked open. Not for lack of interest, because I loved Kurlansky's Cod and can't wait to read The Big Oyster, but poverty of time. The same reason that I don't cook oysters at home very much. Time. Shucking oysters is way too much work. Thanks to Mark Bittman's grilled shellfish blog post this past weekend over on the New York Times, for Eat Drink Local Week, I grilled a couple of oysters to see for myself how easy it is to pry open the shells with a blast of grill heat instead of an oyster knife for a slightly steamed, not quite cooked not quite raw, and tasty bite. Scrub oysters with a good wire brush to remove any sand or seaweed. 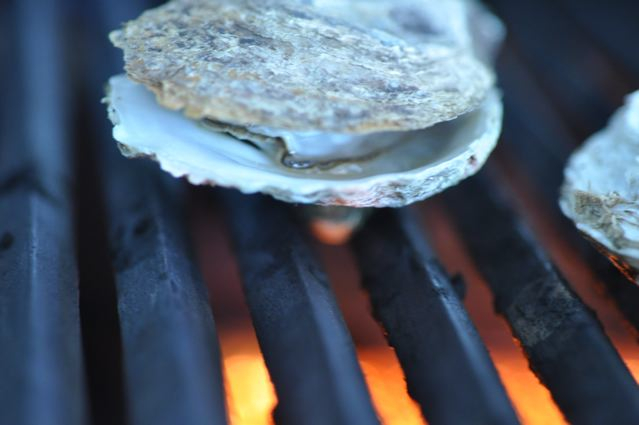 Heat grill to medium-high and place oysters flat side up and curved side down so the liquor remains in the shell's natural vessel. Cover the grill and after 4 minutes or so begin checking every 2-3 minutes removing oysters one by one as they open. Carefully place each cooked oyster in a bowl to preserve flavorful liquid. 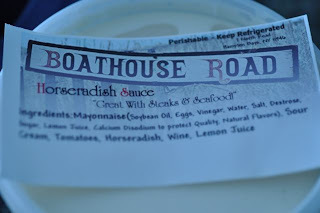 When they are all done and cool, pry open and serve with lemon, Bittman's buttery garlic and Worchestershire sauce recipe on the Times site or a dollop of homemade horseradish mayonnaise (from Boathouse Road at the Southampton Farmers Market). For the inexperienced, oysters are much harder than clams to open as the muscle holding the the shells together is really really strong. And, besides (for me) it's hazardous, as it's pretty much guaranteed that I'll stab myself with the dull blade of the oyster knife more than a few times. I love the grilled oysters method. I bet my New Orleans Oysters Rockefeller loving husband will too! And, now I'll have more time to read The Big Oyster!